Avg. Group Discount of 2.4%! 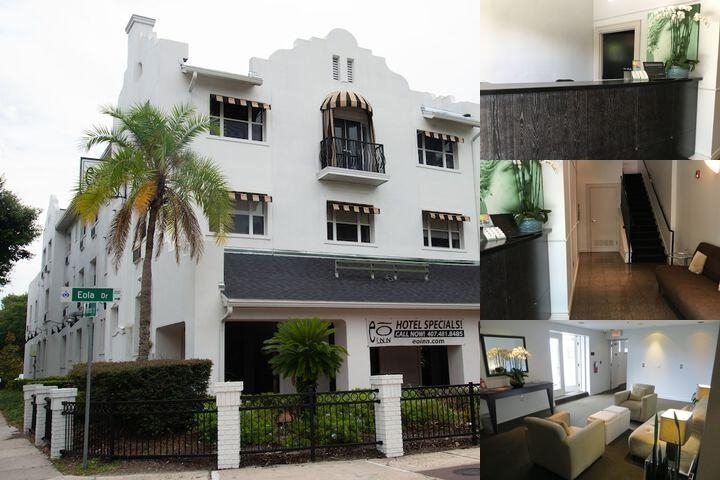 The Eõ Inn & Spa is a small boutique hotel located downtown Orlando on the old-world brick streets of a charming area called Eola South. Situated on the northeast corner of Lake Eola Park, it is just a block away to the famous Thornton Park where many local shops and restaurants thrive. The park is populated daily with walkers & runners enjoying the ¾ mile paved path around the lake observing the gardens with dozens of bird species that reside there. There is a newly renovated playground entertaining children. Most major downtown festivals and events takes place at Lake Eola Park, including a wonderful farmer's market every Sunday. The Eõ Inn & Spa has 17 smartly decorated rooms each with its own private bath. All rooms offer a queen size bed or a king size bed. Our newest room, The Summerlin, offers two queen size beds. The balcony rooms have a quaint covered patio perfect for relaxing outside. Views of downtown and Lake Eola Park are available. Panera Bread restaurant is located on the first floor and room service is available to all guests during front desk hours. There is a 24 hour innkeeper available on site or just a phone call away. Other amenities include free wireless Internet, parking, voice mail, robes, iron/ironing board, hairdryers and cable tv with HBO. Eõ Inn & Spa has a full service day spa offering massages, facials, waxing, relaxing body wraps, spa manicures and spa pedicures. The award winning spa is very popular with the local community and hotel guests alike. Spa parties have become a favorite for our patrons and staff. The Eõ Inn & Spa also has a jacuzzi on its second floor and pool access at our sister property. This inn is perfect for couples and corporate travelers. Wedding parties, family reunions, and other groups may want to consider taking the entire 17 room property to provide a very personal memorable experience for all. Anyone who enjoys privacy in a relaxed chic atmosphere will appreciate this inn. This is not your typical chain hotel. The Eõ Inn & Spa gives every guest a sense of exclusivity and uniqueness that can only be found in a smaller privately owned establishment. The Eõ Inn & Spa has recently been praised and published in Travel + Leisure, Southern Living, USA Today, and other nationally received publications over the past ten years. In addition, the Eõ Inn=2 0& Spa has won multiple local awards making it a household name for the downtown community.The Eõ Inn & Spa is looking forward to welcoming you on your next visit to Orlando.